The royal splendor of purple rises again is this antique-style ring from Apples of Gold. An alluring amethyst gemstone captures any eye with its rich violet hue and round cut style. 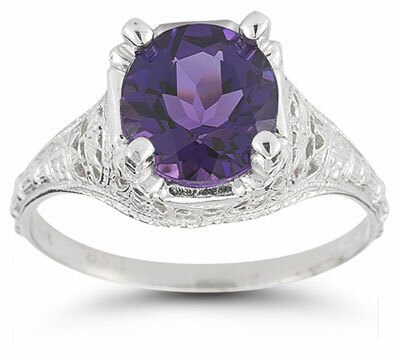 The amethyst is set securely in place by four prongs of 14K white gold. The band offers its own splendor with intricate filigree that truly embodies vintage style and grace. The open-air mounting also brings fancy to the forefront and helps elevate this gemstone ring to regal status. We guarantee our Antique-Style Floral Amethyst Ring in 14K White Gold to be high quality, authentic jewelry, as described above.